Lt. 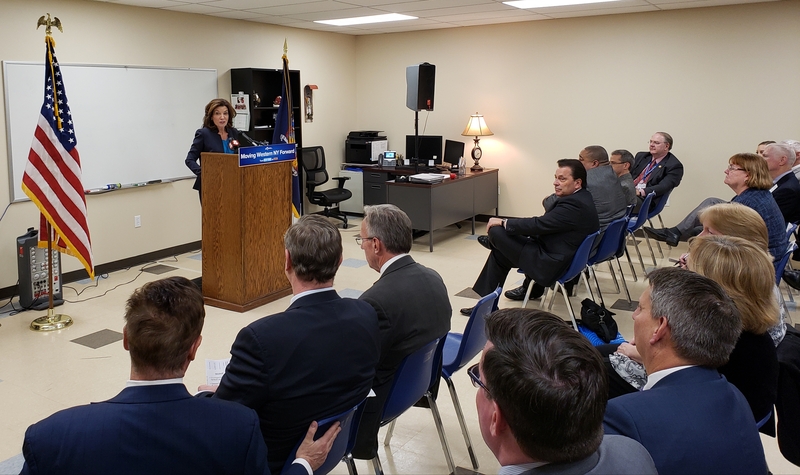 Governor Hochul announces the first round awardees of the WNY Workforce Development Challenge. This $10 million program is designed to promote and invest in innovative approaches to workforce training for underserved populations throughout Western New York. The Workforce Development Challenge will help increase the capacity of community-based trainers who have proven track records, trusted community relationships, and outstanding abilities for outreach and recruitment. In addition, it will support programs in the region’s target sectors currently experiencing growth, including advanced manufacturing, health and life sciences, tourism, energy, and agriculture by providing training for unemployed, underemployed, and/or career ladder opportunities for entry-level and mid-skill workers. It funds best practice models that maximize collaboration between business and workforce trainers. First round awardees were announced in December 2018. A second round of the Western New York Workforce Development Challenge will launch in late 2019. Not-for-profit organizations in Erie, Niagara, Cattaraugus, Chautauqua and Allegany counties could be eligible to receive at least $250,000 for workforce development. Research indicates that employers in high-demand, higher-paying industries need to rapidly identify pools of skilled workers and training programs that meet their needs, and over the long-term, influence the skills of the workforce pipeline to better align their needs. The most recent research on the labor market in the region included an employer survey showing the majority of companies in Buffalo Niagara report a number of hard-to-fill jobs or hard-to-find skills, suggesting the supply of labor could be better matched to industry needs. Jobs that are difficult to fill today and the skills that are challenging for employers to find will be compounded as industries across the region grow. Many industry sectors in the region experienced double-digit job growth over the past five years, and over the next five years, many industries can expect to fill thousands of job openings across the region annually. The region also faces a looming retirement cliff that will impact the labor supply. Applying research and best-practices learned through these efforts, the WDC will leverage and build upon the workforce development already happening in the community and will up-skill underserved populations to meet the needs of growing industry sectors, providing opportunities for the workforce throughout all five counties of Western New York. The grants will be administered by the Community Foundation for Greater Buffalo and Empire State Development. Application and program information available here.